for $179,900 with 3 bedrooms and 2 full baths. This 1,350 square foot home was built in 1974 on a lot size of 6007.00 Sqft. FANTASTC OPPORTUNITY to OWN this BEAUTIFUL 3 BEDROOM 2 BATH home with BONUS ROOM. HOME was A COMPLETE REMODEL in 2013- WITH NEW Kitchen CABINETS, GRANITE COUNTERTOPS, NEW VANITIES, CEILING FANS, ROOF, HVAC, STAINLESS STEEL APPLIANCES and so much more. 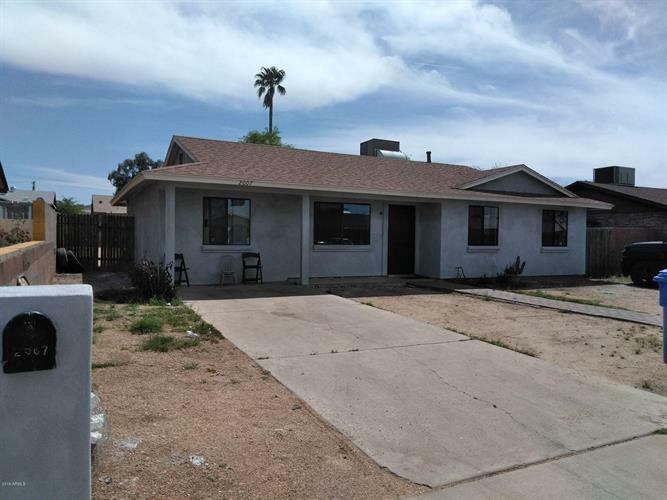 RECENT UPDATES INCLUDES; NEW STUCCO, FRESH INTERIOR AND EXTERIOR PAINT, NEW DUAL PANE WINDOWS, NEW TILE FLOORING TROUGHOUT, NEW BLOCK PRIVACY FENCE ''front yard'' . Best of all NO HOA~ Centrally located with easy access to Phoenix Sky Harbor International Airport, Phoenix South Mountain Park and Preserve, and the new Loop 202 Extension (South Mountain Freeway). Buyer and buyers agent to verify all pertinent information.